Southlake, TX – The National Pawnbrokers Association (NPA) is pleased to announce the launch of its newly re-designed website at www.NationalPawnbrokers.org. The new website streamlines access to the association’s resources, key pawn industry events, membership services, and a trove of information and educational content focused on the pawn industry. It also features a searchable Member Directory, which lists pawnbroker members and industry partner members. The website will help connect pawnbrokers to vendors that serve their needs, as well as assist customers searching for NPA Verified pawnbrokers in their local area. “One of the best features of the NPA website is the amazing amount of new and archived information that is available on the website,” notes NPA President and pawnbroker, Tim Collier. The website organizes hundreds of articles and posts which cover pawn business practices, regulatory and legislative updates, and educational material. Many of the articles have been re-published from National Pawnbroker magazine, and from presentations from Pawn Expo educational sessions. “The website offers information on everything from luxury handbag authentication and e-commerce to government relations and pawnbroker profiles. We hope the membership takes advantage of everything that we are offering on the new website,” said Collier. 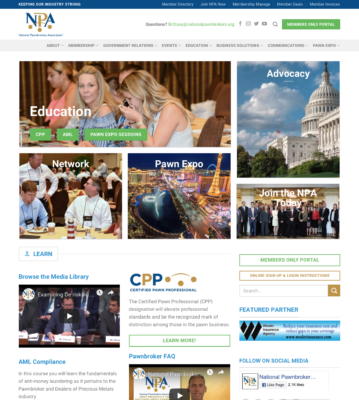 Members can use the website to sign up for the annual NPA Legislative Conference, apply for CPP courses, and register for Pawn Expo, the only national convention and trade show for the pawn industry. Members of the NPA can also manage their membership online. The Membership Manage feature allows pawnbrokers to pay invoices, make donations, and update their business information and mailing addresses. Members can also offer NPA website visitors special promotions by posting in the Member Deals area. Member Deals can be offered by pawnbrokers to customers as well as by industry partner members offering special promotions to pawnbrokers. The NPA has been online since 2000. The last website was developed in 2010 and was a significant step forward in the move to provide pawnbrokers valued online resources. The new website was launched in February 2019 and provides greater access to online services, legislative information, and ongoing educational tools. The NPA website has received almost a million visitors over the last decade. Peak website traffic was during the 2014-2017 period. With the launch of the new website, the NPA consolidated several of its websites into one multi-functional site. This has allowed the association to save time, resources and money, while making it easier to navigate all of the content that the NPA offers to its members. For more information about the NPA or to explore the new website, please visit www.NationalPawnbrokers.org. The NPA works to provide independent pawnbrokers nationwide with resources and tools to strengthen the pawn industry. NPA members are committed to operating their businesses in such a manner as to enhance and promote the positive and professional image of all pawnbrokers. Members believe in establishing positive and long-lasting relationships with local, state, and federal government officials. 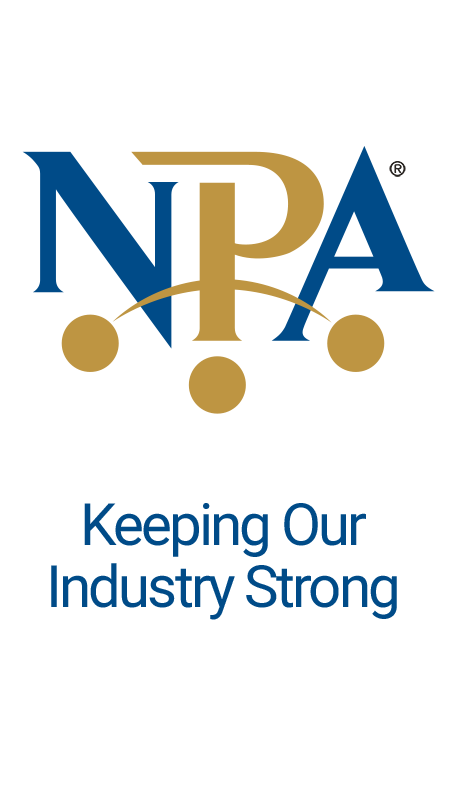 The NPA is the industry’s only national association and is located in Southlake,TX.